Think of all the quintessential fall activities you want to check off this season: apple picking, brewery tour, spa treatment, cider doughnuts. The list goes on. Luckily, there is a one stop town in Upstate New York where you can do all of the above -- and much, much more. Think of all the quintessential fall activities you want to check off this season: apple picking, brewery tour, spa treatment, cider doughnuts. The list goes on. Luckily, there is a one stop town in Upstate New York where you can do all of the above -- and much, much more. Cooperstown -- often praised as "America's Most Perfect Village" -- combines the charm of old, historic town, the allure of top-notch museums, lodging, and attractions, and the beauty of its natural surrounding in a pristine setting. Here is a handy guide to exploring, experiencing, and enjoying Cooperstown this fall. Located within a day's drive of most eastern metropolitan areas (~3.5 hour drive from Manhattan, ~4 hour from Boston, and ~4.5 hour from Philadelphia), Cooperstown is a great destination for a weekend getaway. You can also take public transportation, ranging from bus to train to airplane. The closest major airports are located in Albany, Syracuse, and Binghamton. 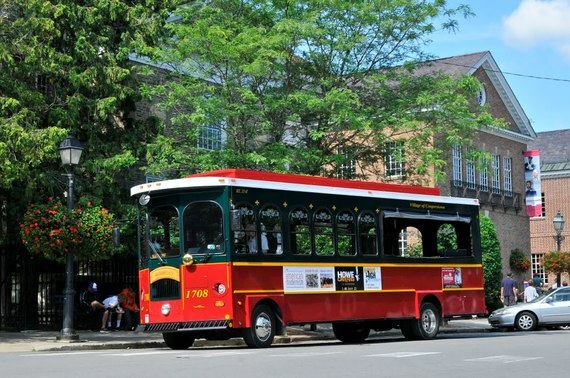 Once you arrive in Cooperstown, you can get around town via the Cooperstown Trolley, which offers service to top attractions like the Baseball Hall of Fame, Fenimore Art Museum, and the Downtown Area. Click here for more information on how to get to Cooperstown. There is no better way to indulge yourself than to stay at Cooperstown's premier resort, the luxurious Otesaga Resort Hotel. Nestled in a picturesque lakeside setting, the Otesaga has been providing charming and gracious hospitality of a bygone era and modern amenities and conveniences of contemporary era since it opened its doors to the guests in 1909. Many of the rooms offer a picture-perfect, panoramic view of the Otesago Lake, and all the rooms are outfitted with modern amenities like complimentary in-room wi-fi, high definition television, and over-sized private baths. The rooms also display artwork reproductions from the nearby Fenimore Art Museum. 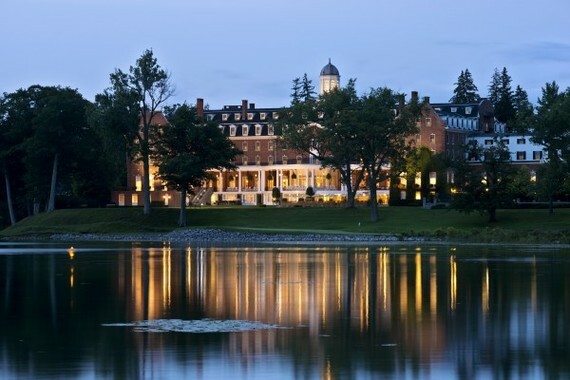 With so many activities and dining options within its premise, the Otesaga Resort Hotel is a destination unto itself. 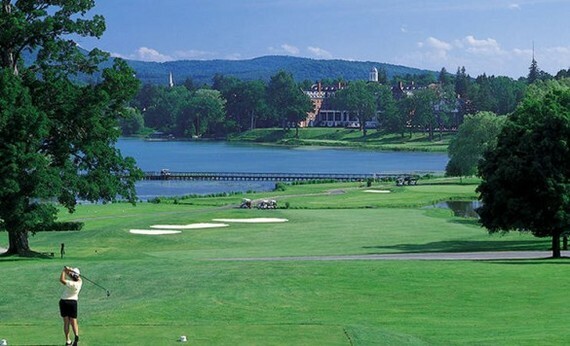 For the outdoor adventurer, you can go for a dive into the heated outdoor pool, bike along or paddle through the "Glimmerglass" lake with the Otesaga's cruiser, canoe, or rowboat rental program, or show off your best swing at the award-winning Leatherstocking Golf Course. You can also get your sweat on at the fitness room boasting state-of-the-art equipment and weights or just relax and settle into a rocking chair on the 180-foot veranda with a good book and a glass of wine. If your ideal vacation doesn't involve exercising (...which is totally acceptable! ), the Otesaga is also the perfect place to treat yourself to delicious meals and relaxing spa. From fine dining in an elegant setting at the Glimmerglass to traditional favorites in a casual environment at the Hawkeye Bar & Grill, the Otesaga offers a rich diversity of mouthwatering dining options featuring seasonal menu with enticing choices. The recent addition of the Fire Bar, an outdoor fire pit, has allowed guests to enjoy drinks and small plates amid a beautiful natural setting overlooking the Otesago Lake. You can also rejuvenate the senses with a relaxing spa treatment at the Hawkeye Spa, which provides unique massages and invigorating facial treatments to smooth and restore the skin and the mind. As though the list of activities within the Otesaga Resort Hotel itself isn't enough to entice you to make a trip to Cooperstown, wait until you hear about all the museums and tours you can enjoy at this village. Cooperstown is perhaps best known as home to the nation's favorite pastime. The iconic National Baseball Hall of Fame, which draws over 300,000 visitors every year, has been around since 1939 as the sacred place to honor the game. 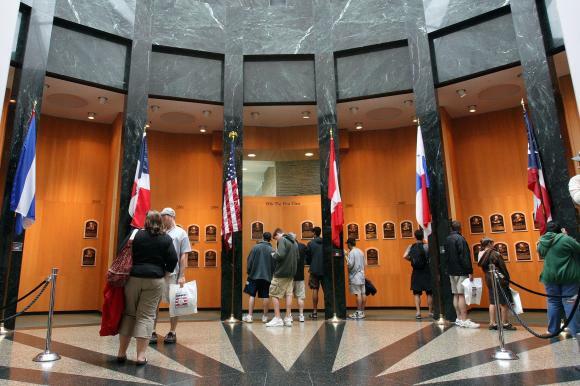 You can journey through the history of baseball and relive its classic moments via the museum's interactive exhibits, special events, and digitally-enhanced multimedia presentations of all things baseball. The renowned Fenimore Art Museum houses a rich collection of American Indian art and American folk art in its elegant 1930s neo-Georgian mansion. 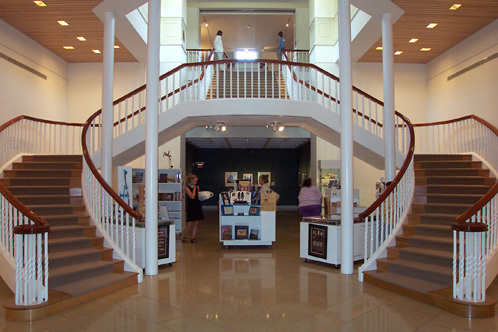 In addition to its permanent collections, Fenimore also offers seasonal exhibitions. This fall, you can view the still life and figurative paintings by American painter Raymond Han, outlandishly vibrant costumes and masks designed and hand-painted by Marc Chagall in his production of Mozart's The Magic Flute, and autopsy and physician's notes from President Abraham Lincoln's assasination to commemorate the 150th anniversary of his death. Right across the street from Fenimore Art Museum, The Farmers' Museum is no ordinary museum. You will feel like you have been transported to New York State in the mid-19th century as you experience an interplay of trade, agriculture, and village life at this interactive venue. Immerse yourself in the era as you watch a pharmacist concoct natural, herbal medicines, a blacksmith sharpen hand-made nails at the grinding stone, and a master printer pressing posters for upcoming events in the village. Don't forget to take a ride on the Empire State Carousel, a beautiful merry-go-round featuring 25 hand-carved animals that represent the agricultural and natural resources found in New York State, as well as chariot rides of a scallop shell, an Erie Canal boat, and an original lover's tub. The selection of pick-your-own fruits and vegetables at the Middlefield Orchard is not limited to apples. At this 130-acre farm bordering Cherry Valley Creek, you are given a plastic bag or a basket to pick as many apples (over 30 varieties! ), pumpkins, blackberries, blueberries, raspberries, and strawberries as you please. At this family-friendly orchard, ladder climbing is not necessary as the dwarf apple trees allow both children and adults to get on their tippy toes to reach for that perfectly crisp, juicy apple. In addition to fruit picking, Middlefield Orchard also provides fresh vegetables like sweet corn, tomatoes, brussel sprouts, and squash. Apple cider, served warm or cold, is synonymous with the fall season. But do you know how it's made? At Fly Creek Cider Mill & Orchard, you can embark on a self-guided tour of this historic, water-powered cider mill that has been pressing fresh sweet cider for more than 150 years. You can learn about the entire process -- from hand-picking and washing of the apples to the grinding and pressing of the juice -- while relaxing on the Mill pond observation deck where you can feed the ducks. Another must-stop at the Fly Creek Cider Mill & Orchard is the Mill Store Marketplace. Stroll through the store to sample over 40 specialty foods, including apple salsa, aged cheddar cheese, hot sauce and condiments, and Mill-made fudge. For a satisfying lunch or a mid-afternoon pick-me-up, stop by the snack bar and bakery, where you can enjoy hearty meals like pulled pork BBQ and chili in a bread bowl as well as seasonal sweets like cider doughnuts and apple slush. Built on a 136-acre land that used to be a hop farm, Brewery Ommegang is a Belgian-style brewery that produces a collection of award-winning beers like Witte, Rare Vos, and 3 Philosophers. Ommengang's beers are made with hops, barley malt, and various spices like ginger, star anise, cumin, and orange peel to create that perfectly rich or refreshing beer flavor. A visit to the brewery starts with a complimentary tour that includes a stop at the brewhouse, or the kitchen of the brewery where sugar water from barley malt is produced, as well as a look into the bottling house where thousands of bottles are filled and packaged for beer lovers around the country every day. You can enjoy a leisurely Belgian lunch at the Cafe Ommegang and pair rotating selection of Ommegang beer with favorites like frites with assorted aioli, liege waffles, or bratwurst. So what are you waiting for? 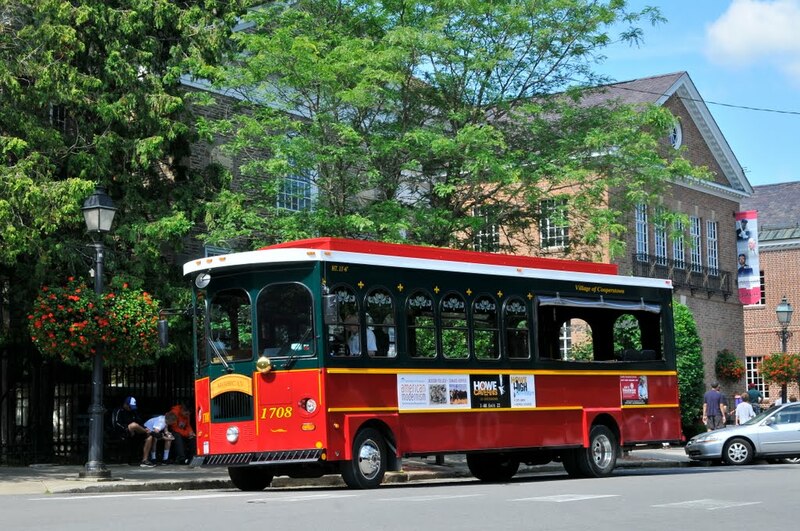 Hop on the train, grab the steering wheel, or get up in the air on your way to Cooperstown!